Sgt. Dorsey Gates was among the 600 members of the Army Reserve's 411th Engineer Battalion reuniting with family and friends yesterday after a year in Iraq. 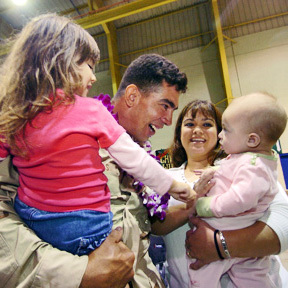 Greeting him were wife Julie and daughters Alana, 3 1/2, and Alyssa, 6 1/2 months, who was born while he was in Iraq.